Persimmon Mokcha Chingudari / let's eat Persimmon together. The month of September has many more to offer . "Chucheok" Korean Ancestral thanks giving and harvest festivals are coming up.In most of the occasion fruit is a must. Do you know one type of fruit that is highly sought after by the Korean people is kam (감). 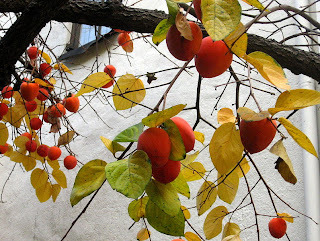 Kam(감) is none other than the colorful and delicious fruit Persimmons. Do you know persimmon is a fruit with so many uses? It’s harvest time in Korea is autumn season ( late September to early December) is the only season persimmons are plentiful. If you live in Korea, you will see them being sold everywhere—from outdoor markets, grocery stores, to subway stations. For about 1,000 won, you can buy four to five persimmons. An affordable and healthy treat, persimmons are rich in potassium, magnesium, and vitamin A.
Persimmon 감, or “gam”, is a Buddhist symbol of transformation. Before the persimmon is ripe, it’s green and very bitter. But, it changes its color to a vibrant orange and is very sweet when ripe. This “bitter to sweet” symbolic fruit is mostly eaten when ripe. Even in the Food Culture of the "Jongga Ancestral Rituals", Persimmon fruit is consider as one of the important ritual food or fruits. According to the scriptures, it is because if you plant the seed of a persimmon, the resulting tree will produce only small-size, astringent fruit. As such, it is necessary to take a branch from that tree, after three to five years, and graft it onto another persimmon tree in order to produce high-quality fruit. The persimmon tree is used as a metaphor for the fact that people must undergo education so that they can become proper members of society. There are two types of persimmons found in Korea. 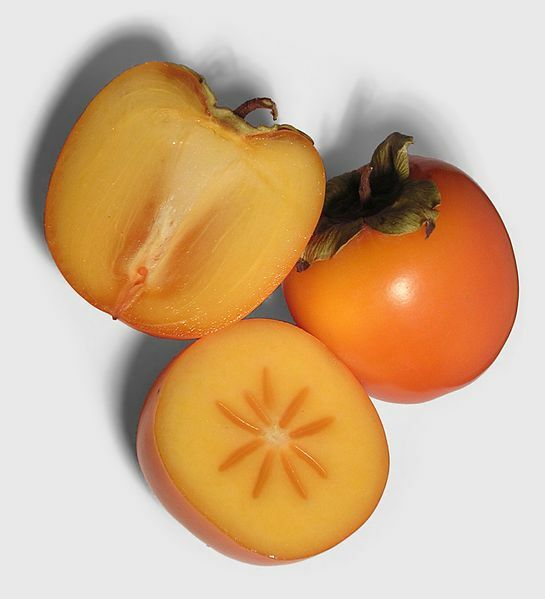 One type is a Hachiya Persimmon 떫은감, or “tteolbeun gam”; this translates into “sour persimmon”. A 떫은감 has a deep orange flesh, is acorn shaped, soft, and is often mistaken for a tomato at first glance. Once ripe, its soft and sweet with a lot of pulpiness. Eating one can get a bit messy too. 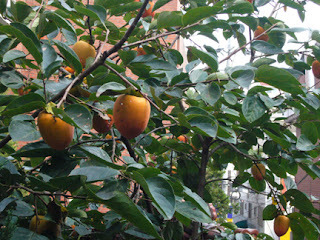 Another type is a Fuyu Persimmon 단감, or “dan gam”; this translates into “sweet persimmon”. 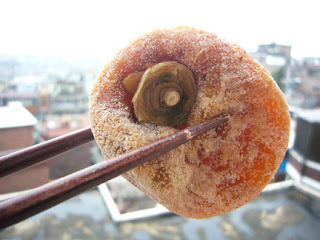 A 단감 has a light colored orange flesh, is round with a flat bottom, and has a crunchy pumpkin-like flavor. One can eat them when they are almost ripe, with or without skin. The Fuyu persimmon is my favorite variety because it is eaten like an apple. Even if you don’t care for persimmons, their rich colors definitely “spice up” Korea’s scenic in a beautiful way. You know Persimmon trees /감 나무, or “gam namu” are found throughout Korea, particularly in mountainous regions out of this tree Korean made furniture. Many Koreans eat ripe and dried persimmons. Year round, Korean markets and grocery stores carry dried persimmons 곶감, or “got gam”. The word 곶 translates roughly into the English definition, “to skewer”. The traditional way to dry persimmons is on skewers. 곶감 are very sweet in taste. We can also use dried persimmons to make a popular dessert punch called 수정과, or “sujeong-gwa”. 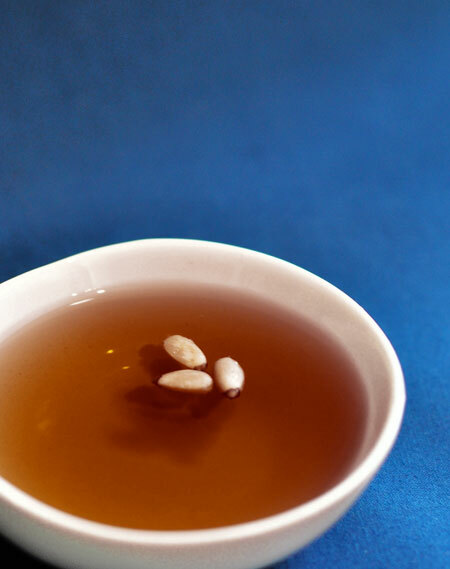 수정과 has a spicy ginger, cinnamon flavor; it’s revered as an acid-reflux and nausea reducer. Agyang Village is known for the Daebong persimmons, which have been growing in the village since the early Joseon period. The Daebong persimmons were of such high quality that they specially reserved for the King in the olden days. Blessed by the clear waters of the Seomjingang river, fresh air from Jirisan Mountain, and the rich Hadong soil, the persimmons certainly carry a distinguished taste. so dried persimmons from this region have minimal loss of vitamins and extra sweetness. The dried persimmons of Hadong are well-known for their extraordinary size and sweetness, and there is well said that once you try them, you will never forget the taste. Every year in November, a festival is held to celebrate the Daebong Persimmons. Korea has been exporting this sweet citrus since the late 1990s. In 1999 the volume exported was 1,800 tons rising to a record 9,700 tons last year. Persimmons are exported to South-east Asia, US and Canada. The main variety exported is Buyu.The main producing area is Gyeongsangnam-do where 90% of the exported fruit comes from. This area has a fairly constant seasonal climate. 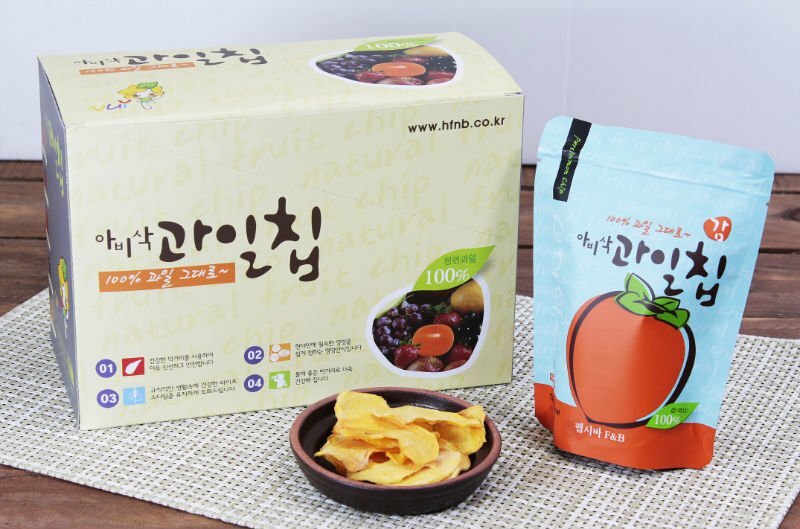 Other counties such as China, Israel and New Zealand have been exporting persimmons for years, but the Korean fruit is becoming recognized for its high sugar content, crispy taste and small size.